Veterans attend Menin Gate ceremony Jump to media player Thousands of people attend a ceremony at the Menin Gate to mark the anniversary of the WW1 armistice. 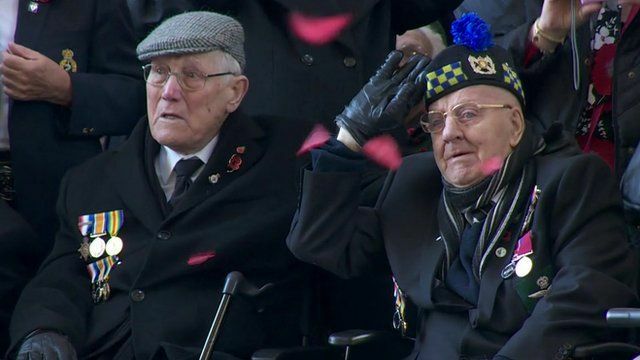 How the world marked Armistice Day Jump to media player Ceremonies have taken place across the world to mark the anniversary of the World War One armistice. Final Tower of London poppy planted Jump to media player The final symbolic ceramic poppy has been planted in the art installation at the Tower of London. Ceremonies have taken place across Europe to mark the anniversary of the WW1 armistice. In the Belgian town of Ypres, which was left in ruins by the conflict, the Armistice Day service took place at the Menin Gate memorial.